While perusing the latest posts from the UK Food Blogs, I came across a blog called What's the recipe today Jim? It's written by Rosie and she shares some fabulous recipes. One of these recipes is a lemon cheesecake, which is going to be on the menu for a wedding buffet that she is organising in August. I made half the amount of the recipe and got 6 individual cheesecakes from the mixture, using small rings and tartlet tins. I also made my own lemon curd for use in the filling, but didn't put it on top. Instead I added fresh raspberries and served it with some raspberry sauce. The cheesecakes were lovely and creamy, with a nice lemon flavour. Thanks for sharing your recipe Rosie! 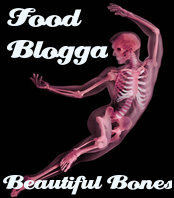 This is my entry into an event called Beautiful Bones, being held by Susan at Food Blogga. Beautiful Bones is helping to highlight the potential risk of osteoporosis, and to encourage women to take steps to protect their bones at every age. You have the whole of May to participate in this important event. Adapted from What's the recipe today Jim? Line a 23cm loose bottomed tin (or individual tins) with baking parchment. Using a rolling pin, crush the biscuits in a large plastic bag until you have fine crumbs. Pour the crumbs into a large bowl and mix thoroughly with the melted butter. Spoon into the prepared tin and press down evenly. Chill in the fridge while you make the filling. In a large bowl, beat the cream cheese, icing sugar, 2 tablespoons of lemon curd and the lemon juice until smooth. I used an electric hand held whisk to do this. Add the cream and continue beating until all the ingredients are combined and thickened. Stir in the lemon zest. Spoon the mixture onto the biscuit base and smooth evenly with a knife. Rosie's recipe says to spread the remaining lemon curd over the top of the cheesecake and put in the fridge to set overnight. The cheesecake can be frozen if wanted. Note: I made half the amount of the above recipe and got 6 individual cheesecakes. I omitted the lemon curd topping and served with fresh raspberries and some raspberry sauce. Now that is some really great photography! Makes you want to pick it up carefully and insert into mouth, whole, followed by another two or three. Stop it - you're making me hungry. What a beautiful little cake! I love the one you made in the tartlet tin, so cute and creative! 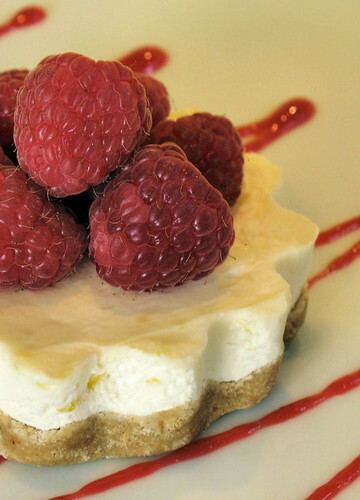 Lemon and raspberries is such a great combo, this looks great Nic! Nic, what a lovely recipe and great photography. I can only aspire to be as good as you! Thanks for sharing this! love the mini-tartlet cakes, looks delish with the raspberries (and great contrast in color compared to the lemon curd idea). Umm yummy! And cute, perfect combo! Gorgeous photo! I love mini desserts! WOW, that is one gorgalicious cheescake, my friend! 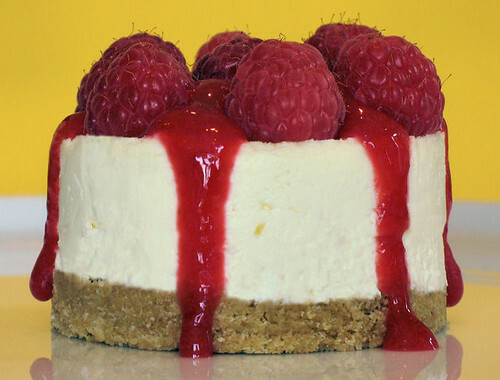 you have made one beautiful cheesecake! can't believe it's a non-bake too :) wish i had some rings to work with. it makes everything so neat and pretty. This has now reached the elevated level of scrummy-licious. Oh Man! Does that look good! I would eat one for breakfast lunch and dinner. Looks delicious!!! You've just convinced me to enter too.. The mini cheesecakes and tartlets look amazingly fresh and light. I could just eat one of those now! Those individual cheesecakes look so good! Trig - thank you! You are funny, you would need a pretty big mouth to get this in, maybe they look smaller than they really are! Susan - thanks for a great event! LyB - I love lemon and raspberries! Raquel - thanks! I think good photos come with lots of practice - I take quite a few to get 1 good one. Mimi - welcome! Thanks so much for visitng. Jerry - hi there, thanks so much! Sweet & Saucy - thank you. All your desserts are so fabulous. Diva - you can just use little baked bean or olive tins. Just take off each end and wash thoroughly! Holler - thank you! Yours are really delicious with the ginger base and mascarpone. Giz - that's for sure! Jeanne - lol, thank you! don't you just love raspberries? Gretchen - now that is just being greedy, lol! Nina - thank you! Hope you do enter. Margaret - they were very light indeed. WOW Nic what a gorgeous photo!!! That cheesecake looks delicious! Absolutely STUNNING...how pretty are these! Your photography is very very nice indeed. Fabulous entry to Susan's (ha ha...she posted from her DHs page again; the dermadoc in disguise). YUM! I love the contrast in flavors and colors -- raspberries and lemons. I also love the use of digestive biscuits here -- I'm not a fan of the graham cracker crust -- and the individual portions. Is there a trick to getting the cheesecake out of the smaller tins without having them fall apart? Gorgeous work, Nic! Yum Yum YUM!!!! LOL - Looks very nice indeedy! That looks yummy. I like the idea of digestive biscuits in the crust. Beautiful, the photo, the presentation and the recipe!I love the fresh fruit you've used..
Oh, my! What a great cake! I want some now:)) Your pictures are stunning. Great recipe!! What a beautiful cheesecake! Your photos are captivating! I find myself staring as if, miraculously, I will eventually bite into them!!! Rosie - thank you so much! Mansi - well it's only got a couple of tablespoons of the lemon curd in it, so you won't really notice it. Passionate Baker - wow, thanks so much! Manju - these little tins had removable bottoms, but you can just put a circle of baking parchment in the bottom, - when cutting the circle, leave a little tab on each side to 'lift' it out of the tin. Hope this helps! Helen - thanks! Digestives are used in quite a few biscuit base recipes over here, must be a British thing! Julie - triple dose might be better!! Medena - thanks for visiting and for the lovely comments! Great photo & fun recipe. I love the combo of flavors & colors. This is such a great way to insure a calcium-rich diet! I could definitely enjoy this little delight! !